Panorama of the Old Town of Sucre. 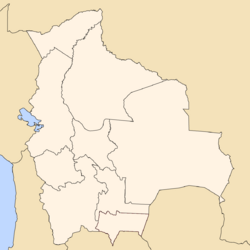 Sucre, which is located in the south-central part of Bolivia, is the constitutional capital and seat of the Supreme Court (Corte Suprema de Justicia) of the country. Sucre is also called “The City of Four Names.” Charcas was the indigenous name for the place upon which the Spaniards built the colonial city, named La Plata. The name Chuquisaca was bestowed upon the city during the independence era, which began in 1809. The city was renamed Sucre in 1839, in honor of liberator Simon Bolivar's right-hand man, Don Antonio Jose de Sucre. Founded in 1539, the city benefited from the mineral wealth of nearby Potosi, and became a major cultural center. The buildings in Sucre's historical center are reminiscent of eighteenth century local architecture, while its religious buildings bear witness to its sixteenth century beginnings. In 1991, Sucre became a UNESCO World Heritage Site, recognized for architectural blending of indigenous styles with those brought from Europe. Nestled at the foot of the twin hills of Churuquella and Sika Sika, Sucre is the gateway to numerous small villages that date from the colonial era. Sucre sits in a fertile valley which is crossed by the Cachimayo River at 9153 feet (2790 metres) above sea level. Its lower altitude gives Sucre a warm temperate climate year-round, and, when it's not raining, sunny days and clean, pure air. The average daytime temperature in January is 61.2°F (16.2°C), dropping to an average maximum of around 56.8°F (13.7°C) in July. Average annual precipitation is 17.2 inches (436 mm), with most precipitation between December and March. As a relatively small city, Sucre is easily walkable. The older sections have white colonial buildings with distinctive red-tiled roofs and balconies. There is evidence that the Andean region was inhabited 10,000 years ago. From about 100 C.E., a major Indian civilization called the Tiwanaku culture developed at the southern end of Lake Titicaca, to the north of Sucre. By the late fourteenth century, a warlike tribe called the Aymara controlled much of western Bolivia. The Inca Indians of Peru defeated the Aymara during the fifteenth century and made Bolivia part of their huge empire until the Spanish conquest in 1538. When the Spanish conquistadores overran the Inca Empire, Pedro Anzures, the Marqués de Campo Redondo, created a settlement called Ciudad de la Plata de la Nueva Toledo on November 30, 1538. The site was inhabited by Charcas Indians, who called the town Chuquisaca. In 1538, the Spanish King Philip II established the Audiencia de Charcas in La Plata with authority over an area which covers what is now Paraguay, southeastern Peru, Northern Chile and Argentina, and much of Bolivia. The Audiencia de Charcas was a subdivision of the Viceroyalty of Peru. During most of the Spanish colonial period, Bolivia was a territory called "Upper Peru" or "Charcas" and was under the authority of the viceroy of Peru. Local government came from the Audiencia de Charcas. Bolivian silver mines produced much of the Spanish empire's wealth, so Spain controlled the region with a firm grip. In 1601, the Recoleta Monastery was founded by the Franciscans and in 1609, an archbishopric was founded in the city. 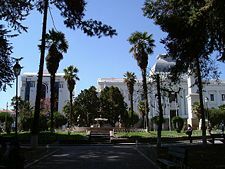 In 1624, St Francis Xavier University of Chuquisaca was founded. Very much a Spanish city during the colonial era, the narrow streets of the city center are organized in a grid, reflecting the Andalusian culture that is embodied in the architecture of the city's great houses, and numerous convents and churches. Until the nineteenth century, La Plata was the judicial, religious and cultural center of the region. 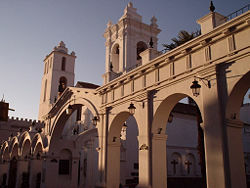 For much of its colonial history, Sucre's temperate climate was preferred by the Spanish royalty and wealthy families involved in silver trade coming from Potosí. Testament to this is the Glorieta Castle. 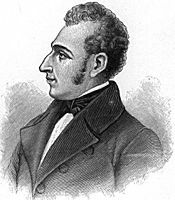 Antonio José de Sucre, for whom the city is named. As Spanish royal authority weakened during the Napoleonic Wars from 1803 to 1815, resentment towards colonial rule grew. The first "Grito Libertario" (Shout for Freedom) in any Western Hemisphere Spanish colony of took place in Sucre in 1809. Independence was proclaimed in 1809, but 16 years of struggle followed before the establishment of the republic, on August 6, 1825. The republic was named after the Venezuelan general who led South American independence, Simón Bolívar (1783-1830). Ironically, Bolivia was the last territory to gain its independence in 1825. In 1839, after the city became the capital of Bolivia, it was renamed in honor of the revolutionary leader Antonio José de Sucre (1795–1830). In 1898, after the economic decline of Potosí and its silver industry, a proposal to move the capital to La Paz sparked a civil war. As a result, Sucre remained the capital in name and law and the seat of the Supreme Court, but the executive and legislature moved to La Paz. The first oil company came to Bolivia in 1921, when Bolivia was found to have great reserves of oil in addition to it's precious minerals. On April 9, 1952, the Nationalist Revolutionary Movement led a revolt and set into motion the Bolivian National Revolution. From 1964 through to the 1970s, control of the Bolivian government changed hands repeatedly, mostly after revolts by rival military officers. Bolivia is a republic. The president, who is both chief of state and head of government, is elected by popular vote for a single five-year term. The bicameral National Congress, or Congreso Nacional, consists of Chamber of Senators of 27 members elected by proportional representation from party lists to serve five-year terms, and a Chamber of Deputies of 130 members, 70 of whom are directly elected from their districts and 60 are elected by proportional representation from party lists, all to serve five-year terms. Bolivia is divided into nine departments, which are further divided into 100 provinces. The provinces are each divided into municipalities and cantons, which handle local affairs. 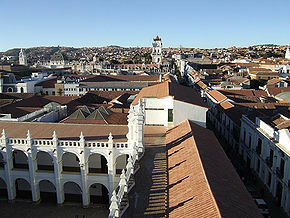 In addition to being the nation's administrative capital, the city of Sucre is capital of the Chuquisaca department. Bolivia is one of the poorest and least developed countries in Latin America. Per capita GDP was estimated at $4400 in 2007. During a long period of high inflation and economic struggle in the 1980s and early 1990s, a large informal economy developed. Roads to Potosí, Cochabamba, and Santa Cruz and secondary roads to nearby valleys have made Sucre a major agricultural center and supplies the mining communities of the barren altiplano. It has an oil refinery and a cement plant. Sucre has an airport. Sucre is home to a large indigenous population, of 225,000 in 2006, who maintain their traditional clothing and customs, and sell their crafts and goods in the markets and fairs. Quechua made up 30 percent of Bolivia's population in 2001, mestizo (mixed white and Amerindian ancestry) 30 percent, Aymara 25 percent, and white 15 percent. Spanish, spoken by 60.7 percent of Bolivia's population in 2001, was an official language of Bolivia, along with Quechua 21.2 percent, and Aymara at 14.6 percent. Sucre remains the seat of the Catholic church in Bolivia, and a common sight is members of religious orders dressed in traditional costume. Roman Catholics made up 95 percent of Bolivia's population, and Protestants (Evangelical Methodist) five percent. Sucre's University—Universidad Mayor de San Francisco Xavier—which was founded in 1624, is one of the oldest universities in the new world. The Cathedral, which was begun in 1551, is a complex colonial religious building with Renaissance, Baroque and "Mestizo Baroque" features. The Chapel of the Virgen de Guadalupe, built in 1617, is next to the cathedral and honors the Virgin with a jewel-covered image painted by Fray Diego de Ocaña. San Francisco, begun in 1577, is honored for the "bell of freedom" calling Sucre's citizens to revolt on May 25, 1809. Santa Barbara—unique Renaissance church constructed in 1887. San Lázaro, begun in 1544, is the oldest church of the Audiencia de Charcas. Casa de la Libertad, located on the main plaza, which is where the Declaration of Independence of Bolivia was signed on August 6th, 1825. Portraits of presidents, military decorations, and documents, including the Declaration of Independence, are displayed. Museo de la Recoleta, which was established by the Franciscan Order between 1601 and 1613, has served as a convent, military barracks, prison, and remains a museum. Biblioteca Nacional de Bolivia, which contains documents of the Audiencia de Charcas and those of the republic. Museo de Charcas, which displays paintings by Melchor Pérez de Holguín as well as furniture handcrafted by native Indians. Museo Antropológico, which displays skulls, pottery, mummies, and textiles from the eastern tribes of Bolivia. Nearby is the town of Tarabuco, which is known as the home of the Yampara culture. The Pujllay festival, which is connected to the Christian Carnival and celebrates a battle won over the Spaniards, takes place each March. 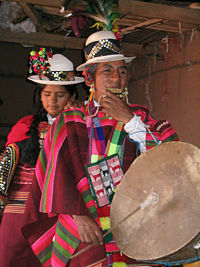 Members of the indigenous community gather for Mass, parade in their colorful traditional costumes, drink plenty of the fermented drink chicha, and celebrate. A site 10 km north of Sucre contains dinosaur footprints as well as prehistoric plant and animal fossils. Sucre's legacy is in its old buildings, which blend local architectural traditions with styles imported from Europe. These buildings have brought recognition as a World Heritage Site. However, as Bolivia's constitutional capital city, Sucre has sustained extended periods of administrative instability, including a series of nearly 200 coups and countercoups, deep-seated poverty, and social unrest. An extended period of stable government would go a long way towards helping Sucre capitalize on its status as a tourist destination. CIA World Factbook. 2009. Bolivia Retrieved January 23, 2009. Hudson, Rex A., and Dennis Michael Hanratty. 1991. Bolivia: A Country Study. Area handbook series. Washington, D.C.: Federal Research Division, Library of Congress. ISBN 9780160321276. Klein, Herbert S. 2003. A Concise History of Bolivia. Cambridge Concise Histories. Cambridge: Cambridge University Press. ISBN 9780521002943. UNESCO World Heritage Centre. Historic City of Sucre Retrieved January 23, 2009. This page was last modified on 14 October 2016, at 19:07.